School of Fish: Help Wanted! As we have been talking with people about our work in Uganda, many have asked, "Is there anything we can send back with you?" There are a few practical items we are want to take back, but most of them are things we need to select and order for school. What we really need is people. 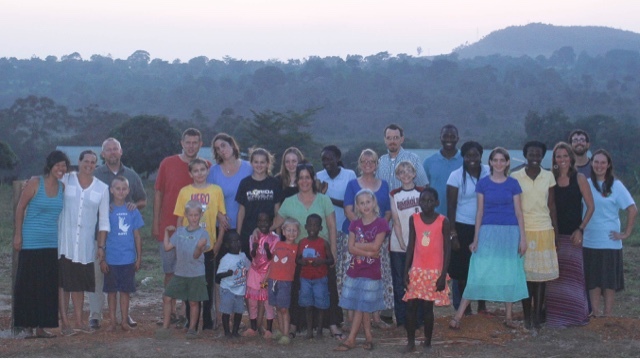 When we go back to Uganda, David and I will be starting a school year with students in Pre-K, Kindergarten, 1st, 2nd, 4th, 6th, 8th and 10th grades. (We do combine some of these grade levels for the sake of our sanity.) Cody Fox, our language arts teacher will be on furlough until mid November. We have been praying that God would provide a helper for our family who could assist in teaching and/or help with our children at home. It has been much healthier for our family when I am able to work part-time and be home with the younger kids in the afternoons. I also still need to rest my tongue part of the day so that it is not as painful by the evening. Please pray with us that God would provide someone to serve alongside us during these four months or so. If you are interested, please email me or private message me on Facebook. In addition to this need, GSF is looking to fill some positions. We are looking for a Director of Education who would oversee the Ugandan primary school and the secondary school and university education of kids who have grown up at GSF. We are also looking for a Director of Outreach and a Nurse and/or Doctor to serve alongside our Ugandan nurse. If you or someone you know is interested in these positions, contact me and I will pass your information along to our team leader. Here is our team photo before our Nurse and previous Director of Education left. We sure do miss them! We are excited about the work God is doing at GSF! Please pray that He would bring the right people to join our team as we follow where He leads our ministry.